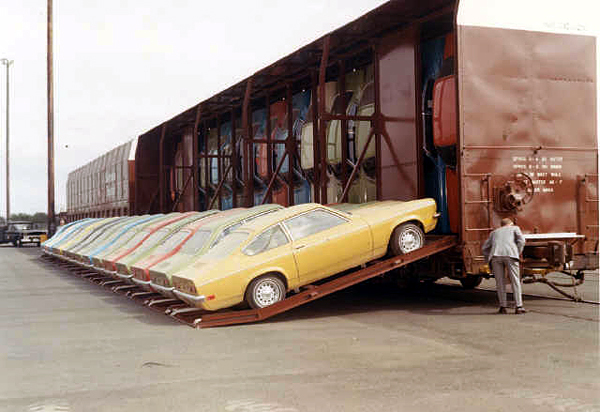 In an effort to cut shipping costs with it’s brand new 1971 Vega Chevrolet worked with Union Pacific to develop “Vert-A-Pac” which allowed 30 cars to be shipped versus 18 that a normal boxcar could carry. Because of the vertical shipping method, the railcars were taller than normal forcing the railroad line to follow special routes to avoid low overpasses. According to Collectible Automobile The Vegas had four removable steel sockets inserted into the undercarriage. As the Vert-a-pac car doors were lifted and closed the Vegas would roll forward an catch on hooks on the doors. When the doors were fully shut the Vegas were suspended side by side, roof to roof. The Vega’s engine oil pan had a special baffle to keep oil from seeping into the number 1 cylinder while the cars were vertical. The battery caps, carburetor float bowls and windshield washer fluid reservoirs were also designed to prevent fluids from leaking during shipping. This entry was posted on Sunday, December 6th, 2009 at 6:11 pm	and is filed under Classic Cars. You can follow any responses to this entry through the RSS 2.0 feed. You can leave a response, or trackback from your own site. This is very impressive, progressive technology for the time. Looking at all these classic cars makes me salivate. I wish that we could have a few of these in our shop to restore! I certainly sold enough of those Vegas in the 70’s! The nicest Vega was the Limited Edition with the Cosworth engine, most others were not that great a car. In todays times onewould frown on the technology. I was never fond of the Vega, but my friend has one he put a V8 in, it really is nice to drive. Very interesting! Did not know they shipped cars like this back then. Just makes sense. 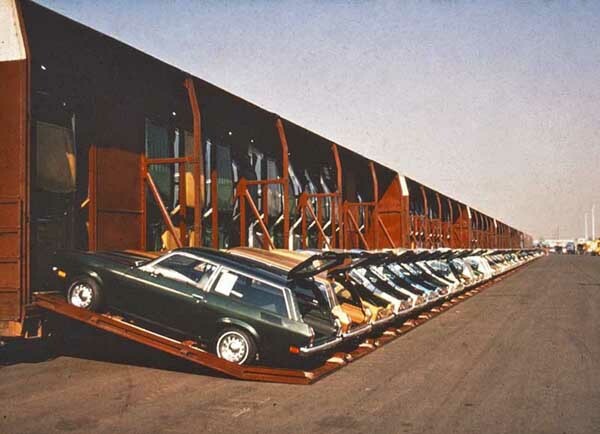 More cars can be shipped vertically. 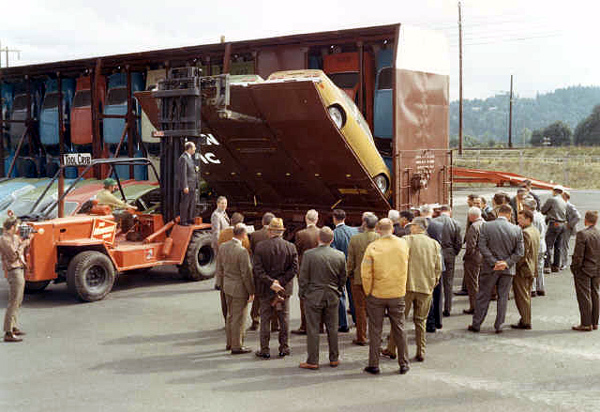 Interesting to know how cars were shipped in past. Welcome to the new Collector Car Ads Blog! Articles, pictures, videos and observations about classic cars.